Over the past few years we have seen a number of application areas benefit from Schema.org markup. Schema.org discussions have often centered around the importance of ease of use, simplicity and adoption for publishers and webmasters. While those principles will continue to guide our work, it is also important to work to make it easier to consume structured data, by building applications and making more use of the information it carries. We are therefore happy to welcome the new Data Commons initiative, which is devoted to sharing such datasets, beginning with a corpus of fact check data based on the schema.org ClaimReview markup as adopted by many fact checkers around the world. We expect that this work will benefit the wider ecosystem around structured data by encouraging use and re-use of schema.org related datasets. Schema.org 3.3 has been released. As always, the release was prepared, debated and finalized by the schema.org community group, and features a range of additions, adjustments, bugfixes and clarifications to improve the expressiveness and usability of our schemas. See the release notes for full details, but of particular note are some changes made around the NewsArticle type (in collaboration with the Trust Project on whose work this is largely based). For many years, our definition of NewsArticle was simply "a news article". With this release we add (via our "pending" mechanism) some more subtlety around News, making it possible to mark-up categories of news including opinion pieces, background articles, reportage, as well as as also introducing types for satirical and advertiser content. We also add properties that encourage greater transparency around News creation and publication. These are flagged as "pending" to emphasize that early adopter feedback on the new vocabulary is particularly welcomed, via Github, the W3C group, or the site's feedback form. These developments complement our earlier work to support interoperability amongst fact-checking sites via the ClaimReview type. Following discussion at GlobalFact4 conference, we have also amended the definition of the "expires" to highlight its applicability to fact checking content. Schema.org 3.1 has been released! Many thanks to everyone in the community who has contributed to this update, which includes substantial new vocabulary for describing hotels and accommodation, some improvements around dataset description, as well as the usual collection of new examples, bugfixes, usability, infrastructural, standards compatibility and conceptual consistency improvements. This release builds upon the recent 3.0 release. In version 3.0 we created a health-lifesci extension as a new home for the extensive collection of medical/health terms that were introduced back in 2012. Publishers and webmasters do not need to update their markup for this change, it is best considered an improvement to the structure of our documentation. Our extension system allows us to provide deeper coverage of specialist topics without cluttering the core project pages. Version 3.0 also included some improvements from the FIBO project, improving our representation of various financial products. We have also introduced a special extension called "pending", which provides a place for newly proposed schema.org terms to be documented, tested and revised. We hope that this will help schema proposals get wider visibility and review, supporting greater participation from non-developer collaborators. You should not need to be a computer programmer to be part of our project, and "pending" is one step towards making work-in-progress schema proposals more visible without requiring knowledge of highly technical systems like GitHub. We have linked each term in pending.schema.org to the technical discussions at Github, but also to a simple feedback form. We anticipate updating the "pending" area relatively frequently, in between formal releases. The site also features a new "how we work" document, oriented towards the Web standards community and toolmakers, explaining the evolving process we have adopted towards creating new and improved schemas. See also commentary on this in the UK government technology blog post about making job adverts more open with schema.org. Many people were involved in these updates, but particular thanks are due to Martin Hepp for leading the hotels/accommodation design, and to Marc Twagirumukiza for chairing the "schemed" W3C community group that led the creation of our new health-lifesci extension. It's time for a round-up of recent developments at schema.org. We made a number of improvements relating to the description of services, including the addition of providerMobility to indicate dynamic locations, OfferCatalog for hierarchical collections of offers, as well as introduced the notion of a GeoCircle to make it possible to describe service availability in terms of distance from a point or postcode. A new type: ExhibitionEvent for describing exhibitions (e.g. in museums, galleries), alongside a property workFeatured that indicates a CreativeWork featured in an Event. This is quite a typical schema.org change: it generalizes existing vocabulary - workPerformed, workPresented - to cover more scenarios with less terminology. Added an inverse of the makesOffer property: offeredBy to simplify the description of not-for-profit offers (e.g. library book lending). Improved our support for feed-oriented structured data, by adding DataFeed and DataFeedItem. Introduced a new type to represent barcodes. These are just a small sample of the vocabulary changes introduced in v2.2. This release also includes non-vocabulary improvements, such as a simpler feedback form (available from every page in the 'more...' section), some updates to the FAQ on documentation re-use and https. We are aware that the technical nature of our issue tracking site on Github is not ideal for some people, and hope that the improved feedback form will make it easier for the project to listen to a broader audience. Finally, the illustration above is included here as a reminder that there is more to schema.org collaboration than fixing bugs and adding new vocabulary. The interactive version applies the D3 visualization toolkit to exploring the schema.org hierarchy. Thanks to Fabio Valsecchi (who made this starburst demo), Gregg Kellogg and Sandro Hawke for their investigations in this area. 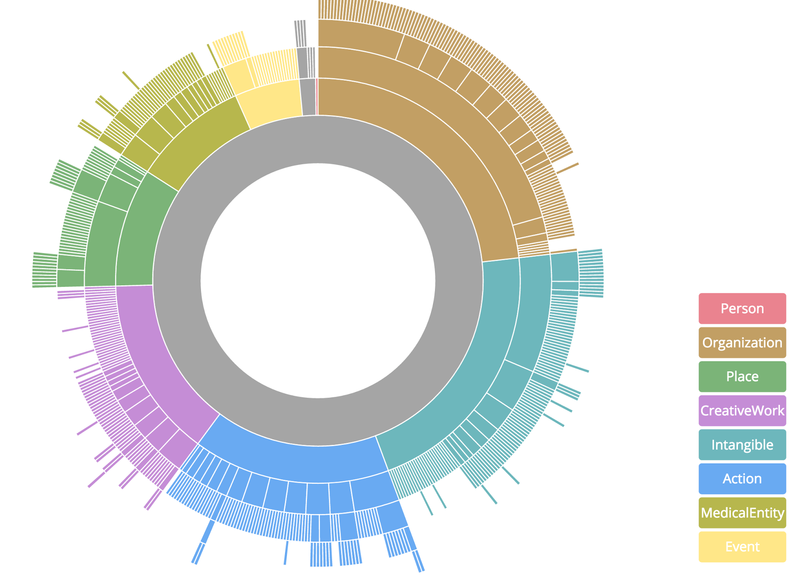 We are collecting visualization ideas and links in our issue tracker. Another area we also encourage collaboration is around finding even simpler ways of sharing schema.org structured data. In particular we would like to draw attention to the CSV on the Web work at W3C, which offers new ways of mapping between tabular datasets and schema.org-style descriptions. To join our discussions on vocabularies, visualization, syntax issues and more, you can join the schema.org community group at W3C.